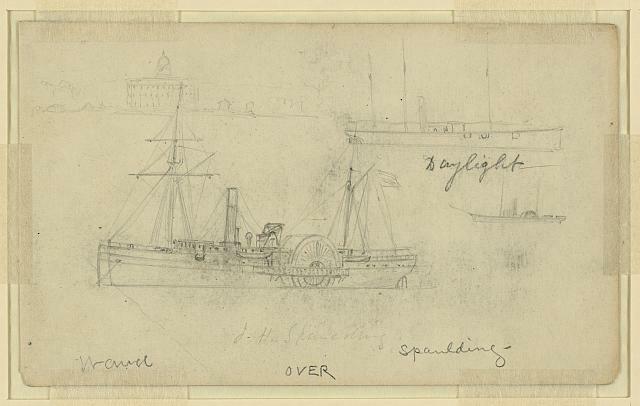 Civil War Letters of John W. Derr: Steamship S.R. Spaulding....You Learn Something New Each Day! Steamship S.R. Spaulding....You Learn Something New Each Day! I just finished reading the most recent blog from Ranger John Hoptak's www.48thpennsylvania.blogspot.com and learned something new as it relates to JWD and the 48th PVI. I encourage all of you go and read his blog as it is the best resource for information pertaining to this regiment and has chronicled a whole series of subjects over the last 5 - 6 years. So, where my blog is more of a family reflection, Ranger Hoptak's is a well researched anthology on the 48th PVI and the Civil War in general. The posting to which I refer, is dated Tuesday, November 8, 2011. The subject is the transport of the 48th PVI to Hatteras Island on the Outer Banks of North Carolina, during the Burnsides Expedition. Ranger Hoptak describes the transit of the 48th via the steamship S.R. Spaulding, a side-wheeled steamer of 210 feet in length by 33 feet in width. This information was new to me and helps supplement my growing understanding of environment under which my ancestor fought. As you know from prior postings, I have described the one steamship that JWD references in his letter of 1862 during the movement of the 48th from Hatteras Island to New Berne prior to the battle of New Berne, North Carolina. Now, I have a second ship to add to this research. Thank you Ranger. Posted here is the same image that is in 48thpennyslvania blogspot, but in doing a deeper dig, I have found others...one being an inked image from the Library of Congress. The Secretary of War has the honor to acknowledge the receipt of the flag of Fort Fisher, and in the name of the President congratulates you and the gallant officers and soldiers, sailors, and marines of your commands, and tenders you thanks for the valor and skill displayed in your respective parts of the great achievement in the operations against Fort Fisher and in its assault and capture. The combined operations of the squadron and land forces of your commands deserve and will receive the thanks of the nation, and will be held in admiration throughout the world as proof of the naval and military prowess of the United States. Interestingly...it appears that after the war the S.R. Spaulding became the S.R. 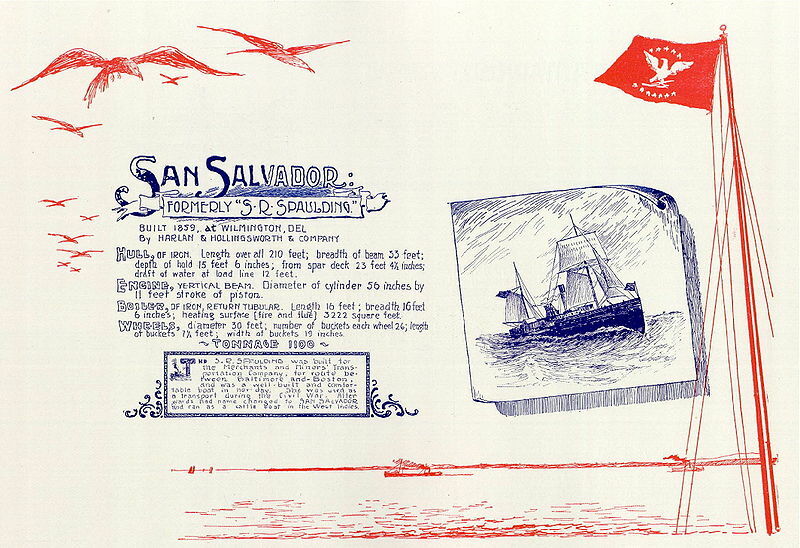 San Salvador, a passenger ship in the West Indies....a far cry from the impressive service it served during the war.